Activated Alumina is a ceramic compound used as a desiccant. It is a very permeable form of aluminum oxide. It has a very high surface-area-to-weight ratio, due to the many “tunnel like” pores that it has (350m²/g). Unlike other desiccants, Activated Alumina adsorbs contaminants in liquids and gases without any change in form i.e. it will not soften or disintegrate when immersed in liquids. Catalyst carrier – f.e. for recovering sulfur in the petrochemical industry. Dehydrating and drying in air separation etc. Acid removal. Reclaiming agent for de-acidic in transformer oil, and de-arsenic agent in the Acid industry. Excellent defluorination agent for drinking water and for recycling alkyl-hydrocarbon in alkylbenzee production. 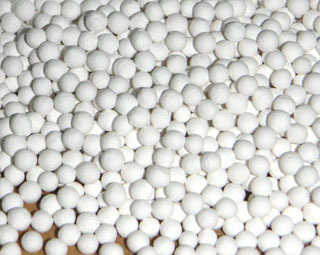 Activated alumina is manufactured from aluminium hydroxide by dehydroxylating it in a way that produces a highly porous material. The compound is used as a desiccant (to keep things dry by absorbing water from the air) and as a filter of fluoride, arsenic and selenium in drinking water. It is made of aluminium oxide (alumina; Al2O3), the same chemical substance as sapphire and ruby (but without the impurities that give those gems their color).